The fabulous French Opera House dominated a vastly different Bourbon Street than the gaudy strip of today. Designed by James Gallier and erected in 1859, the Opera House became the cultural centerpiece of New Orleans both for hosting musical performances and later for its role in the annual carnival celebration. The French Opera House was built in the style of European grand operas. 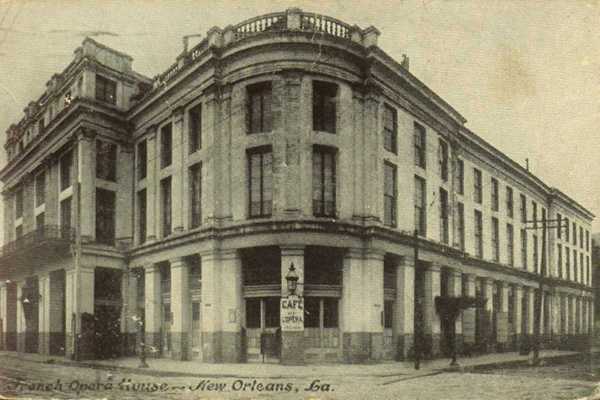 The Greek revival building measured 166 feet on Bourbon Street and 187 on Toulouse Street. The central portion of the Bourbon Street façade projected onto the sidewalk. This arcade protected theatre-goers in bad weather. This was furthered by a gallery projecting over the street. The French Opera House was destroyed in a fire on December 4, 1919. The fire appeared to have started across the street in Silvestre's Restaurant. The exterior walls were brick, but the interior was most likely wood as it only took a few hours for the fire to completely destroy the Opera House. At the time of its destruction, the House was owned by the Tulane University fund. Damages from the fire were estimated at $250,000 but the building was insured for less than ten percent of that. Despite efforts to rebuild, the theatre was closed for good. After the fire, the site was used for a while as a lumber yard and also as a parking lot. Winthrop Rockefeller built a hotel, Le Downtowner du Vieux Carré, on the site in the mid-1960s, about the same time he was elected governor of Arkansas. The property has gone through several owners, names, and concepts since then; today it is owned by the Tonti family and operated as the Inn on Bourbon Street. "French Opera House, New Orleans, La." ~ Source: Image courtesy of the New Orleans Public Library, Louisiana Division Postcard Collection. "French Opera House Season 1919-20, Program. 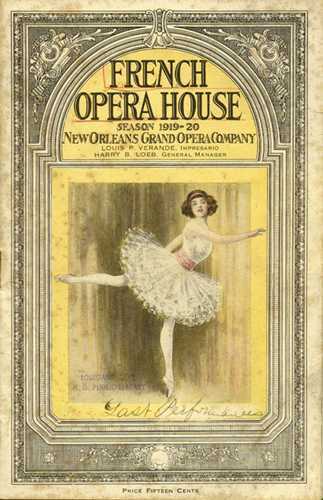 ": "The program for the New Orleans Grand Opera Company's final season at French Opera House, 1919-1920. The company's final performance was Meyerbeer's Les Huguenots." ~ Source: Image courtesy of the New Orleans Public Library, Louisiana Division Rare Vertical File. "French Opera House (gone)." ~ Source: Image courtesy of the New Orleans Public Library, Alexander Allison Photograph Collection. ~ Creator: Alexander Allison, Photographer. ~ Date: 1905-1910. "Ladies in the balcony, perhaps of the French Opera House, during an unidentified carnival ball, undated." ~ Source: Image courtesy of New Orleans Public Library, Louisiana Division, Rare Vertical File. 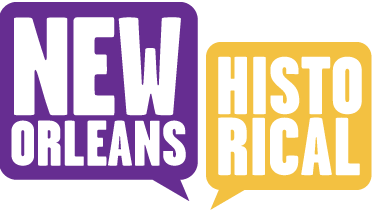 , Tulane University students: Vanessa Smith-Torres, Shelby Farmer, Liesbeth Ramirez, Elizabeth Turner, and Kathryn O'Dwyer, Editor, “French Opera House,” New Orleans Historical, accessed April 24, 2019, https://neworleanshistorical.org/items/show/260. Baroncelli-Javon, J. G. de. Opera Francais de la Nouvelle-Orleans Souvenir Album Saison 1913-1914. New Orleans City Archive. p. 19. “Old French Opera Burns.” The Kansas City Times. 40:77. 4 December 1919. Baroncelli-Javon, J. G. de. Opera FranÃ§ais de la Nouvelle-Orleans Souvenir Album Saison 1913-1914. New Orleans City Archive. p. 5. Widmer, Mary Lou. 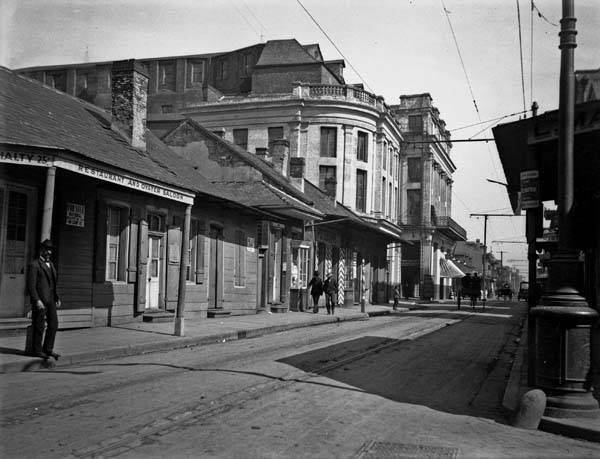 New Orleans 1900 to 1920. Gretna, LA: Pelican Publishing Company, 2007. “Review 1 — no Title.” The Daily Dispatch (1852-1865): 4. Jul 01 1859. ProQuest Civil War Era. Web. 31 Oct. 2012. “Amusements: French Opera House.” The Daily Picayune. 21 December 1880. “Madame Anna Grunwald.” The Daily Picayune. 27 March 1865. “The Accident at the Orleans.” The Daily Picayune. 28 February 1854. 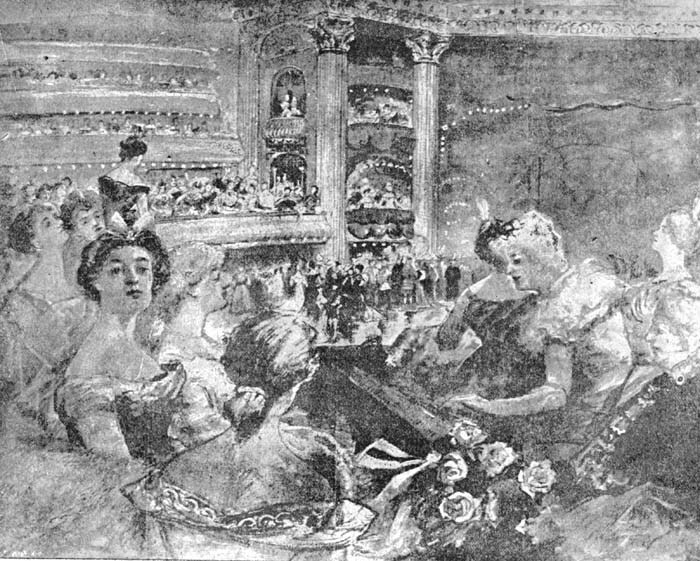 “French Opera House Season 1906-1907.” Programs-Opera 1-10. Box 13. New Orleans City Archives. “Sale of Opera Boxes.” The Daily Picayune. 1 August 1881. “French Opera House, Season 1919-1920.” Programs-Opera 1-10. Box 13. New Orleans City Archives. p. 1. “Mardi Gras Programme.” The Daily Picayune. 22 February 1852. “Holiday Festivals.” The Daily Picayune. 22 February 1865. “Old Landmark in New Orleans Destroyed by Fire Entailing Heavy Loss.” The Daily Herald. 4 December 1919. Saxon, Lyle. “Fire Leaves Famous Home Of Lyric Drama Great Heap Of Ruins Falling Walls Menace Many.” The Times-Picayune [New Orleans] 5 Dec. 1919: 1+. America’s Historical Newspapers. Web. 2 Oct. 2012. “Old Landmark in New Orleans Destroyed by Fire Entailing Heavy Loss.” The Daily Herald, 4 December 1919.